2 PAGE 2 Excerpt text from the main text of a story to draw a reader s attention to the page. Hot Water for Space Heating Generally, a fuel is burned in the combustion chamber of a boiler to create heat. Contemporary combustion chambers are sealed, in that there is a dedicated source of combustion air to support the burning of the fuel, and exhaust gases are vented to the exterior of the building all in a sealed system. 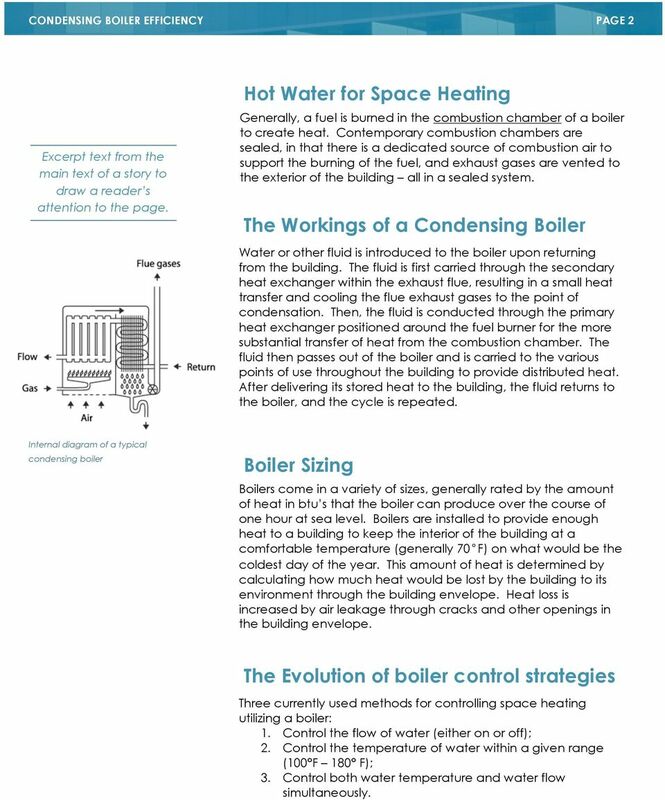 The Workings of a Condensing Boiler Water or other fluid is introduced to the boiler upon returning from the building. The fluid is first carried through the secondary heat exchanger within the exhaust flue, resulting in a small heat transfer and cooling the flue exhaust gases to the point of condensation. Then, the fluid is conducted through the primary heat exchanger positioned around the fuel burner for the more substantial transfer of heat from the combustion chamber. The fluid then passes out of the boiler and is carried to the various points of use throughout the building to provide distributed heat. After delivering its stored heat to the building, the fluid returns to the boiler, and the cycle is repeated. Internal diagram of a typical condensing boiler Boiler Sizing Boilers come in a variety of sizes, generally rated by the amount of heat in btu s that the boiler can produce over the course of one hour at sea level. Boilers are installed to provide enough heat to a building to keep the interior of the building at a comfortable temperature (generally 70 F) on what would be the coldest day of the year. This amount of heat is determined by calculating how much heat would be lost by the building to its environment through the building envelope. Heat loss is increased by air leakage through cracks and other openings in the building envelope. 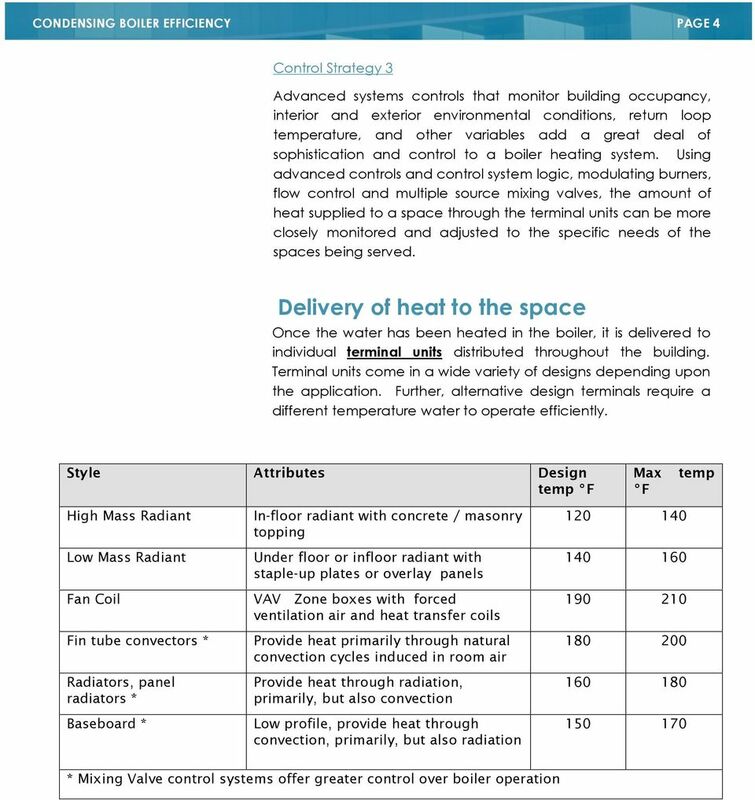 The Evolution of boiler control strategies Three currently used methods for controlling space heating utilizing a boiler: 1. Control the flow of water (either on or off); 2. Control the temperature of water within a given range (100 F 180 F); 3. Control both water temperature and water flow simultaneously. 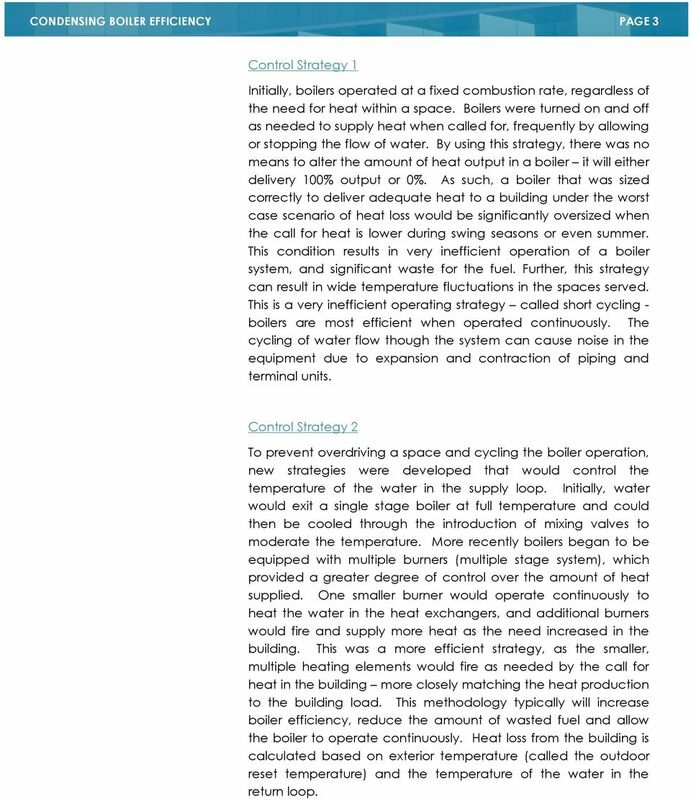 3 PAGE 3 Control Strategy 1 Initially, boilers operated at a fixed combustion rate, regardless of the need for heat within a space. Boilers were turned on and off as needed to supply heat when called for, frequently by allowing or stopping the flow of water. By using this strategy, there was no means to alter the amount of heat output in a boiler it will either delivery 100% output or 0%. As such, a boiler that was sized correctly to deliver adequate heat to a building under the worst case scenario of heat loss would be significantly oversized when the call for heat is lower during swing seasons or even summer. This condition results in very inefficient operation of a boiler system, and significant waste for the fuel. Further, this strategy can result in wide temperature fluctuations in the spaces served. This is a very inefficient operating strategy called short cycling - boilers are most efficient when operated continuously. The cycling of water flow though the system can cause noise in the equipment due to expansion and contraction of piping and terminal units. Control Strategy 2 To prevent overdriving a space and cycling the boiler operation, new strategies were developed that would control the temperature of the water in the supply loop. Initially, water would exit a single stage boiler at full temperature and could then be cooled through the introduction of mixing valves to moderate the temperature. More recently boilers began to be equipped with multiple burners (multiple stage system), which provided a greater degree of control over the amount of heat supplied. One smaller burner would operate continuously to heat the water in the heat exchangers, and additional burners would fire and supply more heat as the need increased in the building. This was a more efficient strategy, as the smaller, multiple heating elements would fire as needed by the call for heat in the building more closely matching the heat production to the building load. This methodology typically will increase boiler efficiency, reduce the amount of wasted fuel and allow the boiler to operate continuously. Heat loss from the building is calculated based on exterior temperature (called the outdoor reset temperature) and the temperature of the water in the return loop. Maximizing Boiler Plant Efficiency. 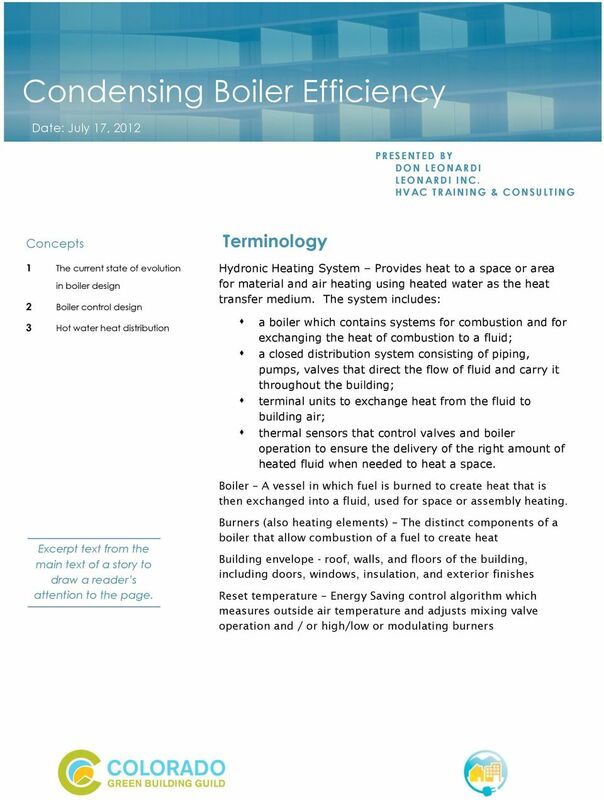 Presenter: Dan Watkins, LEED BD+C Sales Engineer Bornquist, Inc.
Design guidelines for hybrid boiler systems. Columbia Heating Products Company 1409 Rome Rd Baltimore, Maryland 21227 410-242-5300 Toll Free 800-645-7845 www.columbiaheating.com Use this handy guide to determine how much heat existing "old style"
ASPE Seminar Water Heater Piping Strategies Presented by Joe Kalarickal, EIT Regional Sales Manager AERCO International Presentation Overview Water Heater Piping Strategies How to size a water heater? Radiant Ceiling Panels Radiant ceiling panels provide uniform, draftless heating which allows utilization of the total interior, even locations where occupants are seated adjacent to large areas of glass. Steam systems require higher temperatures, which make them inherently less efficient than forced air or hot water. White Paper ENERGY MODELING. 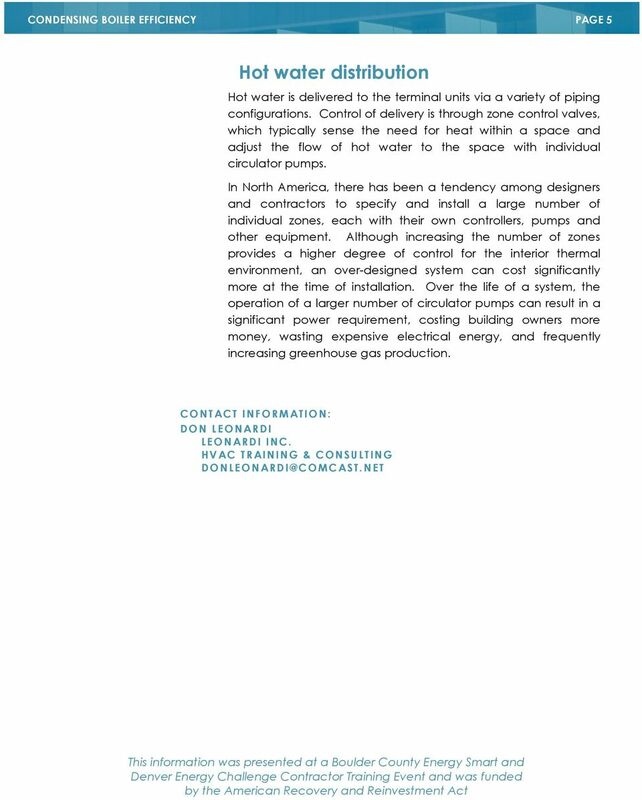 Warehouse Heating Systems. Energy Performance Guidelines for: Utility Rebate Programs. ASHRAE 90.